A train pulls up right when you get to the MAX platform so you run over to the ticket machine only to see “Sorry this machine is temporarily out of service”. It’s frustrating to you and to us. While statistical data ranks the machines’ reliability rate at 90 percent, that’s not the reality customers are experiencing, especially at busier stations. So instead of relying on the data, we are aggressively pursuing solutions to improve the machines and your experience buying tickets. Last fall we began replacing our oldest ticket vending machines (TVM), what we refer to as type 3 machines, with brand new type 6 machines. This will mean that out of the 215 ticket machines along the MAX and WES systems, 117 of them – or more than half – will be new. We started installing the new TMVs last fall and are about 80 percent through installation. All machines will be in place by July 1. 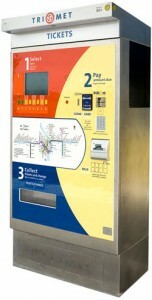 In addition to upgrading the hardware, we’re working on the software that runs on the ticket machines. In the last six months, we’ve implemented several software upgrades and analyzed programs. Among the improvements, we’ve sped up ticket processing and eliminated one bug we called “screen freeze”, where the transaction just timed out. The TVM was then down until a technician on site fixed the error. To track how reliable the ticket machines are and to identify maintenance priorities, we have a program that checks on the status of each machine. For years, those checks were every five minutes. But if something happened between those queries, and lasted less than five minutes, it wouldn’t be tracked. Late last year, we moved to a more robust approach, checking the data every minute. This is a helpful guide but still doesn’t reflect the true customer experience. While there are times the machines will work 10 out of 10 times, there are other times, for example, that they will only work 8 out of 10 times. This still shows us a 90 percent reliability rate. This new approach includes digging deeper into the data looking for issues, conducting more frequent field audits and getting more proactive with the hardware and software upgrades. There are lots of reasons why a TVM might stop working. Some stations see a larger amount of cash purchases which puts a heavier load on the electro-mechanical system or internal devices that process the transaction. Bills can get jammed in the machines. The machine can run out of change. The ticket printer may run out of paper. There can be a software issue, a network connection glitch or a hardware problem. Even vandalism has prevented some riders from being able to buy tickets. Those are just a few of the reasons why a machine might not work when you want it to and then there are scheduled disruptions. The scheduled outages includes a nightly ‘shift change’ that occurs overnight when every machine goes out of service to upload transaction data to the server. Also the machines are put out of service when technicians conduct preventive maintenance, ticket paper and money is restocked, and necessary repairs made. We occasionally have problems that take individual TVMs out of service for an extended period of time as more in-depth troubleshooting is done to resolve the issue. Recently we were finally able to get a few machines that had been down for several weeks back up and running. We are striving to reduce those incidents and more quickly identify longer-term outages. One way to lessen the frustration with TVMs is to increase the options of where and when you can get tickets. Later this spring, we will begin beta testing a mobile ticketing app called TriMet Tickets, with plans to launch it systemwide this summer. You’ll be able to purchase tickets anytime anywhere right on your smartphone. Beyond that, we are exploring a moving toward a full electronic fare system by 2017-2018. Until then, we encourage purchasing a day pass, which is the same price as two 2-hour tickets, when going on an outing or to an event that will last longer than two hours. We also suggest purchasing tickets ahead of time. 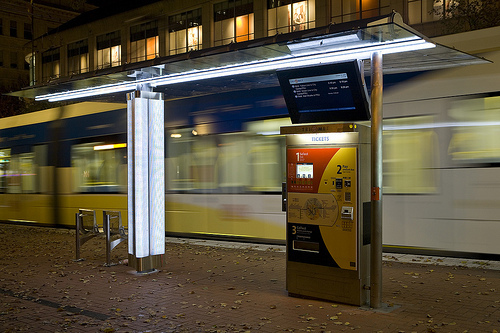 You can buy them at neighborhood ticket outlets throughout the Portland area, including most grocery stores and the TriMet Ticket Office at Pioneer Courthouse Square. You can also get your tickets online at www.trimet.org. While we work to improve our ticket machines, what can you do when you encounter a machine that’s not working? 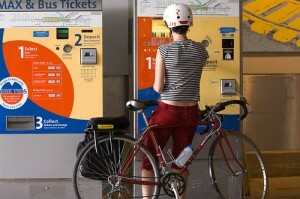 Try the other machine or machines at a station, including those on the opposite platform. Also, if there is a bus nearby, such as at one of our transit centers, you can buy a ticket with cash from the bus operator. Also consider buying tickets in advance. The next time you’re picking up groceries, pick up a book of tickets to have on hand. We’ll keep working on the TVMs. We hope that soon, when you get to the end of your transaction and see the “Thanks for riding TriMet” message, you’ll know we’re making progress.